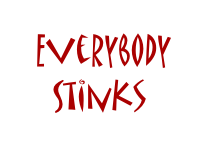 Everybody stinks according to the John Tesh Radio Show. We learned that or something like that the other week on the way to church. We listen to the show and learn something most weeks. And sometimes, I even get an amusing story out of the radio show and the short ride. On the particular week in question, Mr. Tesh told us that people have their own unique odors. He cited the study where he got the information as he always does (but which I could not find after 30 seconds of searching) and told us of some expert’s findings. Apparently, each person’s odor is completely unique. If we had noses like dogs, we could identify people without ever needing to see them. Then again, it is probably better that we do not have superhuman or super dog noses. After all, greeting people face to face is much more pleasant than the way dogs greet each other. And besides, there are some people who we do not even need dog noses to smell from a mile away. Still, without those super dog noses, I suppose that most of us are pretty skeptical of the findings about people having their own unique odors. Even though Mr. Tesh quoted somebody with a “Doctor” title, I still thought it might all be hogwash. Then, for some reason, I thought about babies. It has been a while since our kids were babies, but while I was doubting John Tesh’s source, I had a flashback to those days. In that brief instant of doubt, I remembered that our babies would stop crying when their mother entered the room, but not when anybody else did. At least when they were hungry. We thought it was the smell of mother’s milk that stopped their crying, but that did not completely make sense since one of the boys did not drink his mother’s milk. Even back then, before the research quoted by Mr. Tesh, we knew that the kids stopped crying because they smelled their mother. My flashback and flashback within a flashback took all of two milliseconds and I realized that the John Tesh Radio Show had made me a little smarter. Again. With my limited experience (after all, I have not smelled everybody in the world), I agreed with the researcher and Mr. Tesh that everybody must have a unique odor. Our kids seemed to agree too. As a matter of fact, Thing 2 mulled over the proposition out loud, “Everybody’s odor is distinct.” It was a great summary, but that is not what I heard. Of course, everybody laughed at what I had said. As usual, they made fun of me. Partially, because they could smell me and knew that I am not the mama and partially because of what I said. But they should not have made fun of those words. After all, it really was what the researcher and John Tesh had said. They were just not bold enough to say that we all stink in our own unique stinky way. I am glad that I almost always learn something new from John Tesh on the way to church. The information he gave about unique odors made me wonder for a brief moment what it would be like having dog or superhuman ability to smell. And while there are times when it would be nice to have dog or even baby noses, I am happy with the current state of my smelling ability. I am definitely happy with the way we greet each other face to face. I am happy not being able to recognize each person’s distinct stink and that I got an amusing little story out of the deal. But mostly, I am glad that I had a humorous summary to the show as well – Everybody’s odor really is just distinct stink.